This attractive, 31-story residential condominium tower occupies the full blockfront on West End Avenue between 59th and 60th Streets. It was developed by Apollo Real Estate Advisors and Cambridge Development & Construction and has 173 apartments. Apollo was one of the developers of the Time Warner Center nearby at Columbus Circle. 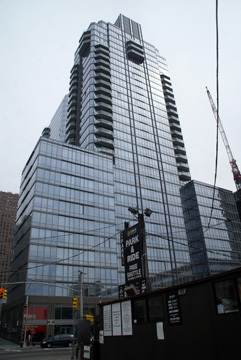 This building is just to the west of The Element, a 35-story condo tower at 555 West 59th Street and the Hudson Condominiums at 225 West 60th Street. The area west of the Lincoln Center for the Performing Arts is in the midst of a building boom. Extell Development has developed two large towers on Riverside Boulevard where it has plans for four more towers and the John Jay College is planning a major expansion on its property at 59th Street. This glass-clad building has floor-to-ceiling windows and was designed by SCLE and completed in 2007. The building has many balconies with angled sides, a bicyle room, a children's activity center created by the Children's Museum of Manhattan, on-premise valet parking, a fitness center by Ari Weller and interiors by Nick Dine. The double-height lobby has honey onyx mosaic walls. The building will have an 11-story base with a central tower with balconies at the corners in the middle for much of its height. Kitchens have Sub Zero refrigerators, Viking ranges, Bosch dishwashers, Jet Mist granite countertops, and wine coolers. Master bathrooms have Kohler undermount double sinks, polished Siberia marble slab vanity tops and tub surrounds, honed Gris de Sienna limestone floors, and polished Italian Bianco Laso Vena Oro marble walls. The building has a 50-foot lap pool with silver blue slate floors and white quartzite walls, cold storage for grocery deliveries, a fitness room and a concierge. It permits pets. The building includes the "Horizon Collection" that consists of seven "penthouses" and two four-bedroom apartments each with a 2,200-square-foot terrace.